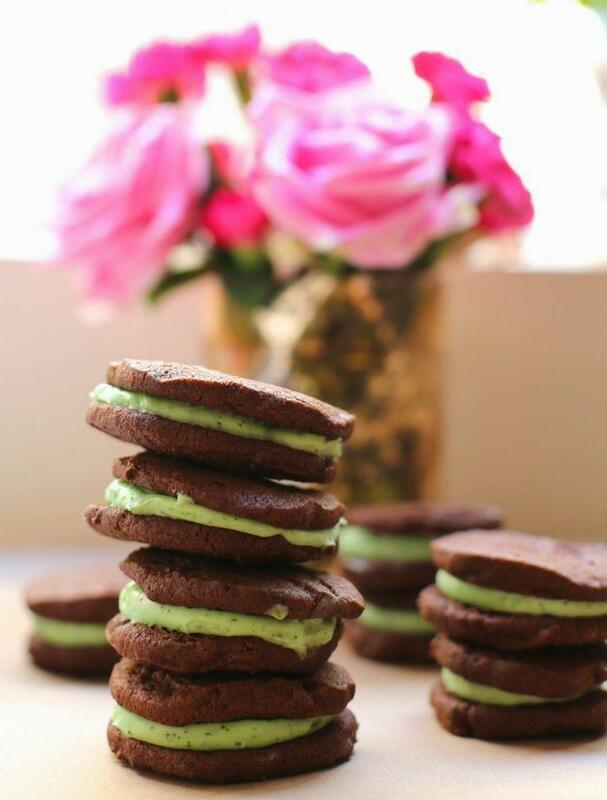 When I came across the chocolate sandwich cookie recipe in The Violet Bakery Cookbook, I immediately knew that I wanted to do my own spin on it and add a mint buttercream filling instead of the suggested salted caramel! These are essentially homemade Oreos and are great for a St. Patrick's Day party or for anytime you're craving chocolate and mint in cookie form. 1For the cookies, beat together butter, sugar and salt until creamy. You can use a stand mixer or electric mixer. 2Add and combine the egg and vanilla extract, mix until smooth. 3Separately, combine cocoa powder, flour and baking powder. 4Sift dry ingredients over the butter mixture and mix to combine. Scrape down the side of the bowl with a rubber spatula to make sure everything is mixed in. 5Take two sheets of parchment paper and prep for dough on your counter. 6Spoon half of the dough onto the center of one parchment sheet. 7With your hands, form the dough into a log about 1 1/4 inches in diameter, more for larger cookies. 8Seal the dough by taking hold of one end of the paper and roll it up and over the log, twisting the ends to close. 10Let rest in the refrigerator for 2 or more hours. 11Preheat over to 320 degrees. 12Line one or more baking sheets with parchment paper. 13Remove dough from the fridge and unwrap. 14Using a knife slice the cookie dough log into 1/4 in. thick rounds. 15Place rounds on baking sheet leaving 1 in. space between each. 17Let cool for 20 - 30 minutes. 18For the buttercream, in a food processor combine all ingredients until well blended. The mint leaves should be well pureéd. 19Scoop frosting into a piping bag and chill for 5 minutes. 20​When cookies have cooled completely, use your piping bag to add mint buttercream in the center of half of the cookies. 21Top with the remaining dry cookies and press down gently. Amount of filling depends on your taste, more or less, it's up to you!